We are always looking for creative ways to use leftovers as a time-saver during a busy week. Grilled shrimp is one of our favorite proteins to transmogrify into a new dish, and quesadillas are a simple but delicious meal. You could also use leftover beef or chicken in your quesadillas, but we like using shrimp because it’s a little different and not something that you can order in just any Tex-Mex restaurant. You can use just about any ingredients that you like in the quesadilla, in addition to the shrimp. On this night, we used a Mexican cheese, jalepeno, green onion and a little lime juice. We served the quesadillas with refried black beans and chips, as well as pre-made store-bought guacamole and pico de gallo (making this an even easier meal to prepare). Start by dicing the jalepeno and green onion. Then cut up the shrimp into bite-sized pieces. Mix it all together in a bowl, along with a squeeze from half of a lime and some salt and pepper. Grate the cheese so it is ready when you start to build the quesadillas. We used a new-to-us cheese we found at Whole Foods called “Queso Quesadilla.” How could we not? It was a good choice — it melted nicely and had a mild and creamy taste. Heat up a cast iron skillet over medium-high heat and add a tiny bit of vegetable oil. When the oil is hot, add a single tortilla and slightly brown it on both sides. You’ll know it’s time to turn the tortilla when it puffs up a little bit. For the first quesadilla we built, we left the tortilla in the skillet and added the chese and shrimp mixture. But then we realized that we needed to heat/brown the other tortilla to go on top, which required removing this tortilla with the ingredients on it to a separate plate. Not the most efficient process (but perhaps a joke in there somewhere about how many lawyers it takes to make a decent quesadilla). For the next quesadilla, we heated/browned the tortilla, then removed it to a plate and added the cheese and shrimp. Immediately after removing the tortilla to the plate, throw another one in the skillet to heat while you’re piling the cheese and shrimp on the first tortilla. Genius! We added a second layer of cheese on top of the shrimp, so it would melt onto the top tortilla. Place the quesadilla back in the skillet to heat a bit more, turning once so it is evenly browned on both sides. Press the quesadilla flat with a spatula while heating it so that the cheese melts all the way through and sticks everything together. Depending on how many you make, you can keep the completed quesadillas on a piece of foil in a 250 degree oven to keep them warm while you cook the rest. Cut the quesadillas into fourths and serve. 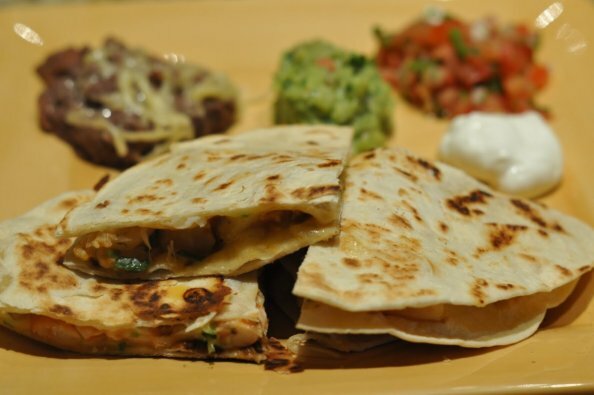 Guacamole pairs nicely with these quesadillas, as does pico de gallo and sour cream. Enjoy!